A public interest litigation was today filed in the Supreme Court, challenging the dismissal of the BJP government in Goa by Governor S.C. Jamir, alleging that he had acted unconstitutionally and in violation of the apex court guidelines on the issue. Uttar Pradesh appears to be the next political Kurukshetra with the Mulayam Singh Yadav Government coming under the twin assault of the Bahujan Samaj Party and the Congress. The Budget session of Parliament is slated to commence on February 25 with the President’s address to members of the two Houses. Minister for Parliamentary Affairs Ghulam Nabi Azad today said the railway budget and the economic survey would be presented on February 26. President A.P.J Abdul Kalam, who underwent a non-surgical corrective procedure for his fractured left shoulder, was today discharged from the Army Research and Referral Hospital. A Rashtrapati Bhavan spokesperson said the President was back in Rashtrapati Bhavan and doing well. 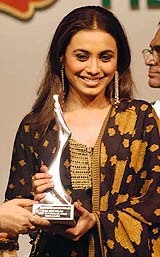 Bollywood actress Rani Mukherjee receives the Film-Goers Award 2005 in Mumbai on Monday night. The Indian People’s Tribunal on Environment and Human Rights has alleged violation of human rights and non-compliance of the rehabilitation process of affected families by Gujarat, Madhya Pradesh and Maharashtra in the Sardar Sarovar project in Gujarat. Several Nepalese political leaders including a former minister have sought refuge in the border districts of Uttaranchal following the volatile situation in Nepal. The CBI today arrested a Joint Director-General of Foreign Trade, Surat, and his associate for accepting a bribe of Rs 2 lakh. While the Joint Director was identified as J.K. Singh, his associate Varghese, a chartered accountant, accepted the bribe on J.K. Singh’s behalf. Several NGOs and health organisations today condemned the move to repeal the Infant Milk Substitutes Act, saying this would lead to aggressive marketing of formula milk and baby products by MNCs and jeopardise lives of millions of infants in the country. The government has reconstituted the Central Board of Film Certification, removing 18 of the 21 members midway through their term and completely reconstituting the Chennai and Hyderabad advisory panels. Aero India 2005, the fifth edition of Indian biennial international air show, will be inaugurated by Defence Minister Pranab Mukherjee on Wednesday. 136 Indian companies, 226 foreign ones from 31 countries, 60 Indian aircraft and 20 foreign aircraft will be participating, Secretary (Defence Production and Supplies) Shekar Dutt said here today. The South district police today claimed to have arrested three accomplices of the main accused in the DPS Patna student Kisley Komal kidnapping case from the Saket area last night. A 15-year-old schoolboy, who claimed that he was ‘abducted’, was found to have made up the story to escape facing a test in his school, the police said today. The boy, studying in the 10th standard, was sent back home after being issued a stern warning, the police said. Bilkis Bano fails to appear before court, case deferred to February 21. Music composer Anup Jalota produces 'Nishan'. “Events such as the dismissal of an elected government at midnight is a warning. After Goa, which government faces the axe is difficult to say,” observed Mr Vajpayee who is also the Chairperson of the NDA. 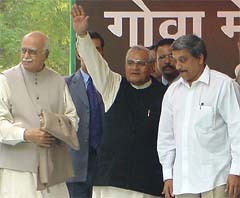 BJP President and former Deputy Prime Minister L.K. Advani maintained that the dismissal of the Parikkar government in Goa showed the attitude of the Congress towards democracy. The “undemocratic and unconstitutional” sacking of the BJP government in Goa, he noted, was reminiscent of the 1975-77 Emergency in the country. In the same vein, he stressed that the Congress-led UPA government should be punished for its sins of removing Governors on ideological grounds. Mr Advani observed that the Goa Governor could have been justified in invoking this provision if the government were reduced to a minority. Emphasising that the NDA’s protest did not dwell on the powers of a Governor invoking Article 164 of the Constitution, he warned that it could boomerang against the Centre if the same provisions were to be used by the President as the Cabinet remained in power at the pleasure of the Head of State. The BJP President said India and China both enjoyed recognition in the world as formidable economic powers but India’s democratic rule gave it an edge. Amid shouts of “Down with dictatorship,” Mr Advani recalled that doubts were raised in the Constituent Assembly about the possible misuse of Article 356 of the Constutition. But Dr B.R. Ambedkar, the prime architect of the statute, defended the provision. Alleging that the Congress-Communist combination always proves to be a “lethal dose” for democracy in the country, Mr Advani said these parties were responsible for the Emergency rule. Those who sat in dharna included NDA convenor George Fernandes, former Union Finance Minister Jaswant Singh and the chief ministers of Gujarat, Madhya Pradesh and Chhattisgarh. A public interest litigation (PIL) was today filed in the Supreme Court, challenging the dismissal of the BJP government in Goa by Governor S.C. Jamir, alleging that he had acted unconstitutionally and in violation of the apex court guidelines on the issue. The PIL, filed in the Registry by Mr Krishna Murari Pandit, a resident from the state, has challenged the Governor’s action on several counts, including that he had acted in a “partisan” manner. Citing the Constitutional provisions and the guidelines laid down by the apex court in the Bomai case, the PIL said that the Governor had on the one hand acted in a tearing hurry to dismiss the BJP government, headed by Mr Manohar Parrikar and install the Congress ministry headed by Mr Pratapsingh Rane, on the other. The new Chief Minister was given 32 days’ time to prove his majority. Such a long time, given to Mr Rane to prove the majority on the floor of the Vidhan Sabha, will be a “fertile ground for horse-trading,” it said. The malafide intention behind dislodging the Parrikar government, was evident from the fact that the independent MLA Filippe Neri Rodreiguez, who was evicted from the Assembly, which was made a ground for dismissal, had been inducted as a minister in the Congress Government. Questioning the induction of Mr Rodreiguez in the ministry, the PIL said under the amended anti-defection law, he could not have been considered an Independent MLA as he was a “primary member” of the BJP, and therefore his eviction from the House was legal as he had not resigned from the Vidhan Sabha, which he was required to do if he had switched his loyality to any other party, the petitioner claimed. The PIL is likely to be listed for hearing soon. Uttar Pradesh appears to be the next political Kurukshetra with the Mulayam Singh Yadav Government coming under the twin assault of the Bahujan Samaj Party (BSP) and the Congress. While BSP leader Mayawati has already declared war against the Mulayam Singh Yadav government, the Congress is also planning to take on the Samajwadi Party leader by launching a smiliar offensive. The Congress is working on a two-pronged strategy in this regard as it plans to raise the pitch against the UP Government both inside and outside the state Assembly. A public agitation programme will be launched by the Congress from Lucknow on February 14 to highlight the failings of the Mulayam Singh Yadav government, including the deteriorating law and order situation in the state. While this agitation will susbequently shift to the districts, the Congress will simultaneously take on the government in the Assembly during the Budget session commencing on February 11. The Congress strategy is to move censure motions against the Mulayam Singh Yadav government on issues ranging from law and order, plight of farmers to corruption in the public distribution system. Although the party is still firming up its strategy, it has tentative plans to move adjournment motions against the government on a daily basis. UPCC President Salman Khursheed and CLP leader Pramod Tiwari today conferred at great length with AICC General Secretary incharge of UP Satyavrat Chaturvedi in this regard. “We want to dispel the notion that we are unable to oppose the government as we are giving it outside support. We want to send out the message that our support is issue-based and that the Congress will not hesitate to take up issues of public interest,” explained a senior UP Congress leader. The Congress is also quick to point out that it cannot move a no-confidence motion against the government as it does not have the requisite strength in the House. Although Congress leaders are at pains to explain that their programme is independent from the BSP’s agitation, the Congress is feeling emboldened after Mayawati launched a protest agaisnt the state government following her party legislator’s murder in Allahabad. Continuing with its anti-Mulayam tirade, the BSP today threatened to launch the second phase of its agitation if the Centre failed to dismiss the UP government by March 20. Meanwhile, the Samajwadi Party hit back,accusing the Congress, BSP and the BJP of being “partial,unjustified and unreasonable” in demanding President’s rule in UP while overlooking Andhra Pradesh where the law and order situation has deteriorated in the recent past. SP General Secretary Amar Singh today demanded the immediate arrest of Andhra Pradesh Chief Minister Y.S. Rajashekhar Reddy and his son, who is named in the murder of a TDP legislator. The Budget session of Parliament is slated to commence on February 25 with the President’s address to members of the two Houses. Minister for Parliamentary Affairs Ghulam Nabi Azad today said the railway budget and the economic survey would be presented on February 26. Normally the two are presented separately but these have been clubbed this year as the next day is a Sunday and the general Budget has to be presented on February 28. The session will continue till March 24 after which Parliament will go into recess to enable the Parliamentary standing committees to scrutinise the grants of various ministries. Parliament will reassemble on April 18, Mr Azad disclosed. President A.P.J Abdul Kalam, who underwent a non-surgical corrective procedure for his fractured left shoulder, was today discharged from the Army Research and Referral Hospital. A Rashtrapati Bhavan spokesperson said the President was back in Rashtrapati Bhavan and doing well. Though it would take at least two or three weeks before Dr Kalam was allowed to move his hand, he, however, did not require bed rest and could return to normal official work. Before leaving the hospital, Dr Kalam visited the experimental laboratory, where a demonstration on mannequins was shown to him. Later he interacted with the hospital staff and children, who were there at the reception, before leaving for Rashtrapati Bhavan. He also met Army Chief J.J. Singh, who called on him. Meanwhile, Railway Minister Laloo Prasad Yadav today wished the President “speedy recovery”. In a letter, he prayed to the Almighty for Dr Kalam’s quick recovery. Noted social activist Swami Agnivesh said an inquiry by the tribunal into displacement, resettlement and rehabilitation of persons affected by the project would be presented to President A.P.J. Abdul Kalam and Chief Justice of India R.C. Lahoti. The “controversial” project, being built in the Narmada valley, has been challenged on several accounts. The withdrawal of the World Bank from the project in 1993, the Supreme Court case, petitions to monitoring agencies — the Narmada Control Authority and the Grievances Redressal Authority —have played an important role in the struggle by people, including high-profile social activists and NGOs, in the case. Swami Agnivesh said the apex court judgement in this regard had been blatantly flouted by the authorities concerned and the government was continuing the work on the dam. At its full height of 138.68m, the dam will affect over 41,000 families in 245 villages. Tribunal members, comprising B.D. Sharma, Harish Mander and Chitra Palekar, concluded that the dam, even at its current height of 110m, was violating the Narmada Water Dispute Tribunal Award of 1979 as well as the Supreme Court judgement of 2000 (Narmada Bachao Andolan vs Union of India and Others). Both of these mandate that all families must be rehabilitated before submergence. At least 12 leaders from the Nepali Congress and the Left Wing Nepali Communist Party sneaked into Pithoragarh, Banbasa, Champawat and Udham Singh Nagar fearing crackdown. Evading the possibilities of arrest after the royal coup in Nepal, former Education Minister Dilendra Bahadur reached Banbasa immediately after the emergency was declared. Nepalese leaders slipping into the Indian territory has increased the security concerns along the border. Home Minister Shivraj Patil, who visited Dehra Dun to discuss the security situation on the Indo-Nepal border, however, parried the questions about the security concerns caused by the leaders taking refuge into the border districts. The situation needs to be studied before the government decides on what ought to be done about this, he said. Meanwhile, a number of student leaders and activists have come to Pithoragarh after the declaration of emergency. Most of the leaders are putting up with their relatives and friends. Uttaranchal shares a 250- km porous border with Nepal manned by the SSB. The border districts of the state have witnessed a rise in influx of people from across the border during times of crisis in the past. There are seven check posts and 20 other routes to cross over from the border, official sources said. The CBI today arrested a Joint Director-General of Foreign Trade, Surat, and his associate for accepting a bribe of Rs 2 lakh. While the Joint Director was identified as J.K. Singh, his associate Varghese, a chartered accountant, accepted the bribe on J.K. Singh’s behalf. 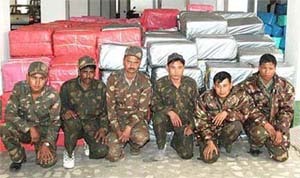 Acting on a complaint from an export firm engaged in export of fabrics, the sleuths arrested the duo. J.K. Singh had invited a representative of the firm and demanded a bribe of Rs 53 lakh. He also threatened to cancel all 25 Duty Free Replenishment Certificates given to the firm and also impose a penalty in case the bribe was not paid. In another case, with the arrest of three persons the CBI today claimed to have busted a passport racket and recovered 277 passports from their possession. At least 3,000 passport size photographs of different persons, three visa stickers of an European country and fake passbooks of a nationalised bank were also recovered from their possession. The accused persons were identified as Hemant Gandhi, Amit Kumar Khatri and Dheeraj Bansal. The sleuths said the seized passports were issued by passport offices in New Delhi, Chandigarh, Mumbai, Jalandhar, Ahmedabad, Guwahati and Bhopal. The passports were issued to various persons with false identity, for sending them to European countries. Several NGOs and health organisations today condemned the move to repeal the Infant Milk Substitutes (IMS) Act, saying this would lead to aggressive marketing of formula milk and baby products by MNCs and jeopardise lives of millions of infants in the country. A petition signed by several NGOs and health organisations in this regard would be sent to Prime Minister Manmohan Singh and President A.P.J. Abdul Kalam, urging them to ensure that the Act is not repealed as scheduled with the enactment of the new Food Safety and Standards Bill 2005. Dr Vandana Prasad of the Jan Swasthya Abhiyan (JSA) said if the infant food industry was brought under the trade-oriented food safety Bill, it would endanger lives of millions of infants. Dr Mira Shiva of the Voluntary Health Association of India said marketing strategies made formula milk look like something more modern and healthier than breast milk, which even managed to attract poor uneducated women in villages. However, using formula milk meant greater risk for infants as it required increased hygiene like boiling of milk bottles and good quality water. The move comes after the sudden sacking of Anupam Kher in October last year, when he had just completed a year of his three-year term as the film censor board chief, following which Sharmila Tagore was asked to take charge. Those who have been retained in the central board include Mrinal Pande, Sanjiv Goenka and L. Suresh. The new entrants in the central board are M. V. Bhaskar Rao, Vinod K. Bakshi, Krishna Mohan, Anis Durrani, Bobbeeta Sharma, Priyambada Mohanty Hejmadi, Shanta P. Halagi, K. Indira Banerjee Mrunalini D Patel, T. S. S. Chauhan, Virendra Saxena, K.T. Mahi, Sanjeev Bhargava, A. Natarajan, Himanshu Joshi, P. S. Bhaktavatsalam , Shravan Shroff, and Rajiv Arora. Aero India 2005, the fifth edition of Indian biennial international air show, will be inaugurated by Defence Minister Pranab Mukherjee on Wednesday. 136 Indian companies, 226 foreign ones from 31 countries, 60 Indian aircraft and 20 foreign aircraft will be participating, Secretary (Defence Production and Supplies) Shekar Dutt said here today. Among the highlights of the air display will be the LCA Tejas, the Sarang ALH helicopter display team of the IAF, the Russian Mig 29 M2, the American F-15 E, the British Advanced Jet Trainer, Hawk 100 (which was flown by the Chief of Staff Air Chief Marshal S.P. Tyagi today), and the Indian Navy's Sea Harrier. The inaugural fly past will also feature two Mirages plugged into an IAF IL-78 air refueller. The F-15 E has now been included in the air display list, while the Orion P3C will be on static display. Acting on a secret information that the three suspects were in the Saket area, the police swung into action and nabbed them. They were later identified as Brijesh (25), Rajan Choudhary (24) and Rajesh (23). Deputy Commissioner of Police (South) Praveer Ranjan said they had been accused of harbouring Vijay Thakur, the main accused in the kidnapping of Kisley. Kisley was released by his abductors last week. Brijesh, who is based in Bihar had been involved in several criminal cases and had come to Delhi recently. However, Rajan Choudhary and Rajesh alias Chintu, are based in Delhi, and run some business here. A 15-year-old schoolboy, who claimed that he was ‘abducted’, was found to have made up the story to escape facing a test in his school, the police said today. The boy, studying in the 10th standard, was sent back home after being issued a stern warning, the police said. The boy had made an oral complaint that he was abducted by a four-member gang in front of his school and that he was later released, a few kilometres away from his institution after the gang realised that he was not the boy they intended to kidnap. The Election Commission today ordered posting of additional observers in the Ajnala Assembly constituency in Punjab where a byelection is scheduled on February 23. Apart from deployment of central paramilitary forces in the constituency, extensive videography would also be undertaken during the poll, EC sources said. 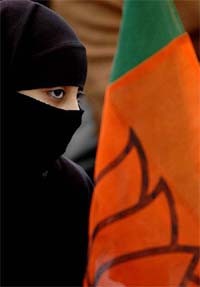 The sources said the special measures were aimed at ensuring fairness of the poll.